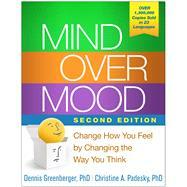 by Greenberger, Dennis; Padesky, Christine A.; Beck, Aaron T.
Discover simple yet powerful steps you can take to overcome emotional distress--and feel happier, calmer, and more confident. This life-changing book has already helped more than 1,100,000 readers use cognitive-behavioral therapy--one of today's most effective forms of psychotherapy--to conquer depression, anxiety, panic attacks, anger, guilt, shame, low self-esteem, eating disorders, substance abuse, and relationship problems. Revised and expanded to reflect significant scientific developments of the past 20 years, the second edition contains numerous new features: expanded content on anxiety; chapters on setting personal goals and maintaining progress; happiness rating scales; gratitude journals; innovative exercises focused on mindfulness, acceptance, and forgiveness; 25 new worksheets; and much more. *Learn proven, powerful, practical strategies to transform your life. *Follow step-by-step plans to overcome depression, anxiety, anger, guilt, and shame. *Set doable personal goals and track your progress (you can photocopy the worksheets from the book or download and print additional copies). *Practice your new skills until they become second nature. See also the Spanish-language edition: El control de tu estado de ánimo, Segunda edición. Dennis Greenberger, PhD, a clinical psychologist, is the founder and Director of the Anxiety and Depression Center in Newport Beach, California. He is a past president and Founding Fellow of the Academy of Cognitive Therapy (ACT), and has practiced cognitive-behavioral therapy for more than 30 years. His website is www.AnxietyAndDepressionCenter.com. Christine A. Padesky, PhD, a clinical psychologist, is the cofounder of the Center for Cognitive Therapy in Huntington Beach, California, the coauthor of five books, and an internationally renowned speaker. A graduate of Yale University and UCLA, she is a recipient of the Aaron T. Beck Award for significant and enduring contributions to the field of cognitive therapy from the ACT and the Distinguished Contribution to Psychology Award from the California Psychological Association. Her website is www.MindOverMood.com.